Did you just buy the superb new iPad Air or Retina iPad Mini? Or are you planning to get the new Apple tablet from the upcoming Black Friday deals? If you are the lucky one, we think these multitasking tips will help you get through your new devices. Especially if you aren’t fan of using Home button for switching between apps. 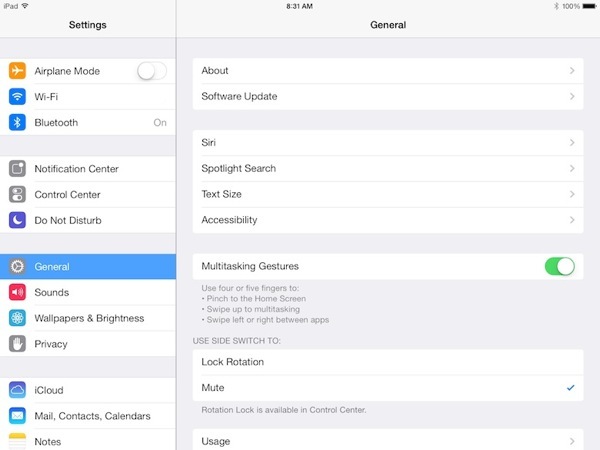 Ready to learn about iPad Air multitasking gestures? Here we go! Every new iPad comes with multitasking gestures enabled by default, however, you can check from Settings > General and scroll down to Multitasking Gestures to toggle enable it. If it is not enabled by default, toggle On/Off. Swipe up on the screen with four or five fingers anywhere on the screen to get the multitasking switcher. This switcher shows you card previews of each app that are currently opened. Scroll through apps from going left and right. You can also switch to any one of these apps by simply tapping on it. To kill an app on iPad Air, simply swipe up on one of the app cards and it will be made to exit. Swiping between apps on the new iPad is now easy. For those who are fans of of ⌘ + Tab on your Mac for easily switching between apps, you will appreciate it. Simply swipe left or right on the screen with four or five fingers to switch and select any app. We usually use Home button to get out of any app and go to home screen. Alternatively, you can a do a four finger pinch to get to home screen. Have you been already using these iPad Air multitasking gestures? These work on all the iOS 7 updated Apple tablets including the very latest Retina iPad Mini and the earlier models of iPad 4 and 3.